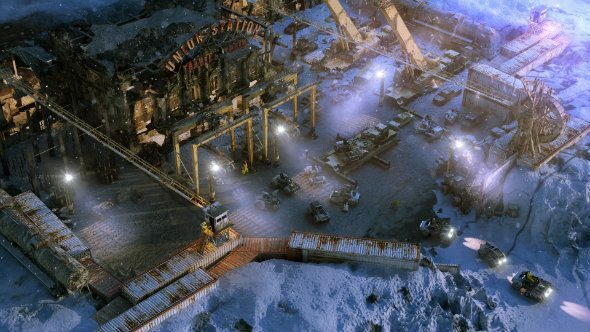 Wasteland 3 has been announced by inXile. This post-apocalyptic sequel will follow a band of travelling Rangers as they try and survive the harsh climate of frozen Colorado. For more questing, chatting and tactical fighting, check our list of the best RPGs. As well as letting you improve your Ranger base,this sequel features story-driven synchronous or asynchronous multiplayer. It’s not just narrative-based multiplayer like Divinity: Original Sin, Wasteland 3 plans to experiment with players affecting each other’s worlds. In this multiplayer mode, two players will field a different team of Rangers. When within proximity, they can engage enemies in the same turn-based battles, but players will feel each other’s actions far beyond combat. When apart, players will be able to impact the world without their friend, with towns and outposts offering different reactions to you based on the actions of your ally. “Let’s say that you’re sleeping and I go on a mission where there’s a sickness among some cattle,” studio head Brian Fargo told Polygon. “I decide the resolve it by killing them all. You wake up and you’re notified that mission is complete. Another example given was where one player convinced a town that the other player was some kind of messiah – the second player than might have trouble leaving because they see it as some kind of bad omen. As for other new stuff,there’s also an upgradeable vehicle for travel. You can use it to store goods, explore, get out of the cold, or even for cover in combat. It will also look a lot better, as you’d expect. “It looks great. It’s lightyears above where Wasteland 2 was, and it’s all in-engine,” Fargo said. “The other thing is that it’s great for conversations, a la Fallout 4. The camera is going to come down and you’re going to see and hear people speaking their lines, which really helps drive the immersion. Wasteland 3 will be crowdfunded, but it’s ditching Kickstarter in favour of Fig, a platform that lets people invest in projects at the higher tiers.The minimum investment is $1000. The Wasteland 3 Fig campaign launches next week, October 5, with a funding target of $2.75m, or which $2.25m is the maximum inXile will take for equity.